In America, Halloween is a big deal. Americans spend $7.4 billion on Halloween — and $350 million of that is for costumes for their pets, reports the National Retail Federation. About 15 percent of Americans will buy costumes for their pets. 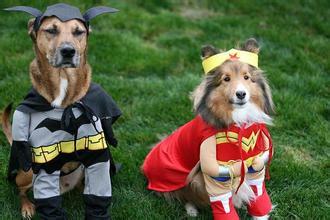 Time magazine reports that more people are purchasing Halloween costumes for their dogs — up 24 percent since 2010. Spending has increased by 40 percent in the past two years. Go online, and you can buy a Robin Hood outfit for your dog. Or a Wonder Woman dog costume. Or a cow costume. The outfits come in various sizes. Purchase a large one for your Mastiff or a small one for your Chihuahua. They cost as little as $7.80 or as much as $300. In Hollywood, pet costumes for movie characters and celebrities are popular. Some dogs are dressed as Edward Scissorhands or Kim Kardashian, reported Entertainment Weekly. In New York, Jimmy Kimmel, the late-night television host, held a dog costume parade on his show. Cat owners can also participate in the fun. Stores sell orange and black cat nail clips and a Halloween bow tie costume collar. Why are Americans spending so much on their pets? Time magazine reports that "pets have more status today," and "more than nine in 10 owners consider their pets to be members of their family." Many people have strong emotional ties with their dogs and cats. The Halloween pet costume craze is spreading globally. Zoher Kapu is vice president of global optimization and data for eBay, the online marketplace. He told the Chicago Tribune that eBay had 1.5 million pet costumes for sale on Oct. 21 out of 800 million items listed. There were 159 million active customers in 200 countries. In Britain, The Telegraph newspaper noted that pet owners will spend $1.5 billion in 2015 on non-food items for their pets. This includes clothes, toys and holidays. Do you plan to dress up your dog or cat for Halloween? I don't hide it,but I don't make a big deal about it. He'd go water skiing or catch a late-night movie. 1.Cat owners can also participate in the fun. Stores sell orange and black cat nail clips and a Halloween bow tie costume collar. They invited the world to participate in at international exposition. He asks whether I can participate in the meeting. 2.In Britain, The Telegraph newspaper noted that pet owners will spend $1.5 billion in 2015 on non-food items for their pets. This includes clothes, toys and holidays. Do you plan to dress up your dog or cat for Halloween? The children thought it great sport to dress up as pirates. She like to dress up for a party.